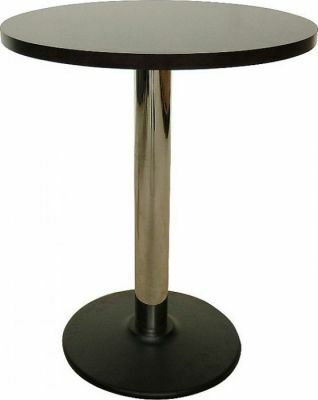 Cafe table base with a Chrome column and round Black base. Available from stock in a choice of three heights. Easily assembled. Delivered within 3-5 working days from order. Maxima café tables consist of a heavy duty, stable steel circular base and chrome column. These café tables are delivered flat packed for self assemble and held in stock in the UK for a 3-5 day delivery. Maxima café tables can be used in conjunction with a number of café table tops from out table top section, up to a maximum size of 800mm circular or 700mm x 700mm square. Please contact us for further information on this range of café tables.